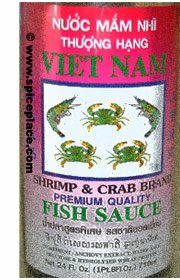 Fish sauce (or Nuoc Mam Nhi) is one of those seasonings that we don’t find as a standard item in most kitchens in America. There’s probably a lot of people that would toss it out simply because of the smell. But if you’ve ever eaten at a Chinese restaurant, the odds are you’ve ate this seasoning. To most Americans the smell of fish sauce would be a turn off, but when added to foods the smell vanishes and a delicious flavor results. 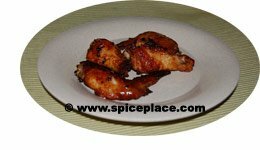 So here’s is a delicious Oriental Seasoned Chicken Wings recipe that gets it’s taste from two Asian sauces, fish sauce and oyster sauce. If you have neither of these in your kitchen cabinet then go out shopping for them at an Asian market, start with the lower priced ones first. Believe it or not, the lower cost fish sauces smell less. In a Pyrex cup, mix the soy sauce, fish sauce, oyster sauce, ginger, garlic, onion flakes, and sesame oil together. Blend well. Set aside to allow flavors to blend together. Disjoint or cut the chicken wings into little drumsticks and wing sections. Wash the chicken pieces, then place in a large ziploc storage bag. Pour the soy sauce / fish sauce marinade into the ziploc bag, seal, then flip over a few times to distribute the marinade over the wings. Place the wings laying flat in refrigerator and let marinate for 2 hours. Turn over every 20 – 30 minutes. Place the marinated chicken wings on a baking pan that has been covered with non-stick aluminum foil. Try not to let the chicken wings touch together. Bake for 25 minutes on a side. These Oriental Seasoned Chicken Wings could also be served as an appetizer. Since spring is here, and picnic season is right around the corner, we thought we’d share our world class Deviled Eggs recipe. 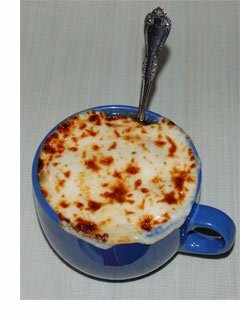 This is a recipe of one of our employees, and they are always a hit when we have pot luck luncheons. To make the hard boiled eggs called for in this recipe, place the eggs in a large pot and cover with tap water. Place on the stove, and bring the water to a slow boil. Cook for 10 – 15 minutes at slow boil, then remove from heat. Carefully place pan in sink, turn on the faucet, and add cool water until the water is cool enough to safely drain. Carefully place eggs in a large bowl to cool. Cook eggs until they become hard boiled. When eggs cool enough to handle peel off the shell. Slice eggs in half length wise. Scoop out egg yolks into a bowl. Add to the mashed egg yolks, the ground pepper, dry mustard and 4 tbsp mayonnaise. Mix egg yolk mixture well, and add more mayonnaise to get desired consistency. Spoon the deviled egg mixute into the opening ih egg white. Sprinkle top of deviled eggs with paprika for flavor and presentation. Keep deviled eggs refrigerated until ready to serve. On weeknights, we’re always trying to find shortcuts and save time making dinner. But we don’t want to sacrificed taste or quality. Often times that’s a challange as taking those short cuts will inevitably lead to loss of quality, flavor or both. 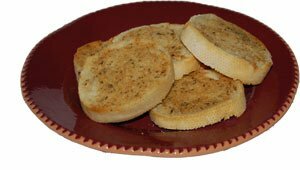 One of the reliable shortcuts we often take is making garlic bread with Johnny’s Garlic Spread & Seasoning. While making garlic bread usually isn’t the longest task of our evening meal, if we can save 5 minutes preparation time, and still have a delicious garlic bread we feel it’s worth it. Slice Italian bread about 3/4 inch think. Place the Italian bread slices on a cookie sheet that is covered with a piece of aluminum foil. Bake 10 – 12 minutes until tops of bread turns light brown.